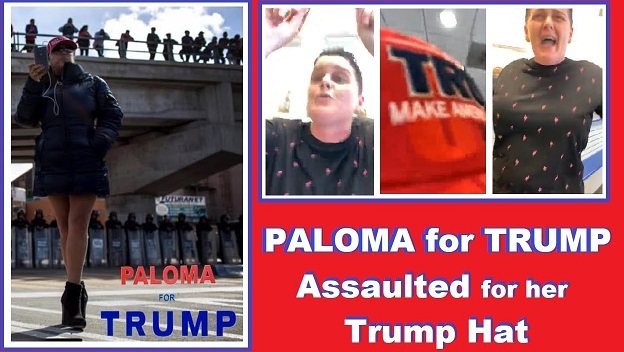 Less than a week later, another incident occurred, this one captured on camera as a Mexican Trump supporter who goes by the internet handle of "Paloma for Trump," was harassed by a loud-mouthed liberal harpy, but then turned the tables on the woman(?) by turning on her camera, and then lambasting the woman(?) for her harassing her. As soon as the camera began with Paloma for Trump telling the person she had no right to harass her for wearing a MAGA hat, the woman had a temper tantrum over being recorded. It appears these deranged liberals think they have the right to harass anyone they disagree with, but they don't wanted it captured and shared all over the internet. 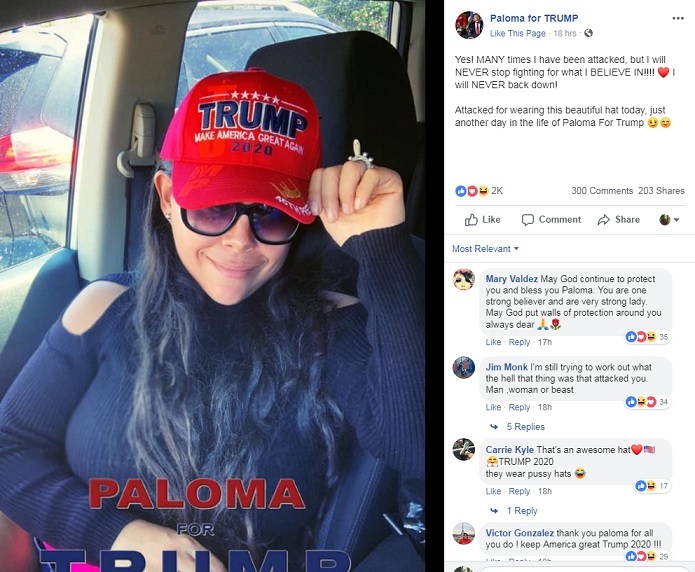 Before watching Paloma show us exactly how to handle it when someone becomes completely unhinged and harasses and physically attacks, it is noteworthy that Paloma for Trump has dual citizenship in Mexico and the U.S., which she uses to report from the southern border. According to her Facebook post about this incident, she states "Yes! MANY times I have been attacked, but I will NEVER stop fighting for what I BELIEVE IN!!!! ❤️ I will NEVER back down! Attacked for wearing this beautiful hat today, just another day in the life of Paloma For Trump." While the original incident wasn't caught on camera, at about the 27 second mark, when the "person" is trying to deny harassing Paloma, a guy can be heard in the background stating very clearly "I saw it." Also note that twice in this short clip, the person physically tries to stop Paloma from recording her, appearing to try to knock the camera/cell phone out of her hands. That seems like assault and hopefully this person can be identified, and Paloma will press charges. In my piece from Saturday, I warned that should President Trump win re-election, we can expect mass civil unrest from liberals, which will make the riots and protests that followed the 2016 presidential election look like a walk in the park, but as these incidents of Trump supporters being attacked because they wear a MAGA hat increase in frequency, it is apparent that panic is setting in for liberals suffering Trump Derangement Syndrome, leading up to the 2020 presidential election. These types of attacks aside, that panic can be seen in a number of recent headlines, as Democrat socialist presidential candidate Bernie Sanders argues that felons should be allowed to vote from behind bars, and multiple democrat candidates are pushing for "reparations" for blacks, with other black pundits mocking the attempt to pander to blacks, saying "Again, they try to treat us as idiots." We saw Speaker of the House Nancy Pelosi floating the idea that 16 year olds should be allowed to vote. The disconnect between the far leftward lurch into socialist policies by democrat politicians, compared to the left of the center ideology of most democrat voters, is clearly illustrated as even Barack Obama attempts to send them a warning and a message, telling them "One of the things I do worry about sometimes among progressives, we start sometimes creating what’s called a ‘circular firing squad’ where you start shooting at your allies because one of them has strayed from purity on the issues." You know you have gone too far when even someone as far to left as Obama is telling you it is too much, yet they march on, allowing the most radical of the new democrat politicians to lead them all straight to the edge of the cliff. Another issue that is concerning the more moderate democrats is the open anti-Semitism being espoused by the loudest of the new democrat congress women, which is why we see the Republican party preparing big money play for Jewish voters in 2020. 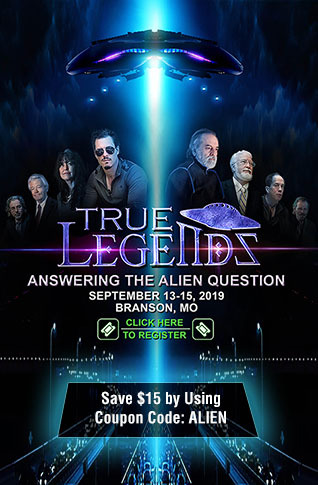 Related: "Whoever said “Jews don’t like President Donald Trump” apparently hasn’t seen this"
Another thing that seems to have caught democrats by surprise is president Trump's fundraising juggernaut, which has brought in $129 million as of the end of 2018, while the DNC coffers are low after Hillary Clinton's failed presidential race of 2016. With the liberal media suffering massive decreases in viewership, and readership after special counsel Robert Mueller reported they did not establish any conspiring or coordination, aka 'collusion' between Russia and president Trump's campaign in 2016, after the MSM had hammered the "collusion" narrative for over two years, it seems to have lit the fuse on liberal panic, which is why I predict more of the types of harassment and attacks against Trump supporters, that is described at the top of this article. 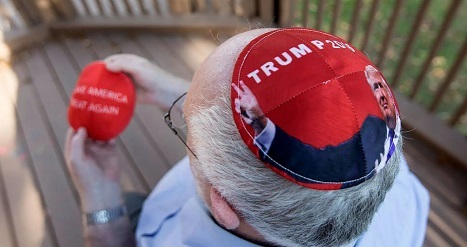 Note to Trump supporters: Learn the lesson Paloma for Trump just taught everyone, if you are going to wear your MAGA or Trump hat, (or yarmulke! ), or any type of MAGA or Trump 2020 gear in public, make sure you have your camera ready to record, because the time for sitting back is over, it is now time to use our brains against their derangement and make sure their faces are splashed all across the Internet every time they rabidly attack. As is discussed in the short MRCTV video below, the liberal media ignores or downplays attacks against Trump supporters, as they did the elderly Jewish man attacked in Starbucks, and the harassment of Paloma, because it doesn't fit the narrative they have been pushing for more than three years, which is why conservative and Independent Media must highlight them, expose the people behind the attacks and spread the attackers faces far and wide. Heading into the 2020 election cycle, the panic from liberals, online and offline, is becoming more apparent as the harassment against conservatives and Trump supporters escalates. Be careful out there, because a number of individuals are becoming outright unhinged, which makes them dangerous.